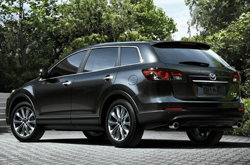 The 2015 Mazda CX-9 is a spacious three-row crossover SUV fit to transport up to seven passengers. It arrives completely unchanged for the new model year, packing the same outstanding features and components that were available on the previously released 2014 Mazda CX-9. Complete with an easy-access third-row seat, roomy interior and robust 3.7L V-6 engine, the latest model is a must-have car for longtime Mazda fans. Check out our 2015 Mazda CX-9 review below to learn more about the crossover and all of its top-notch features. Generating 273 horsepower and 270 lb.-ft. of torque, the Mazda CX-9's 3.7L V-6 engine is both powerful and reliable. It can be outfitted on both all-wheel-drive and front-wheel-drive models, and it comes equipped with a six-speed automatic with manual shift control. Due to its highly capable transmission and engine, the 2015 Mazda CX-9 in Houston can produce an EPA-estimated 19 mpg combined, 17 mpg city and 24 mpg highway with front-wheel drive. The crossover also has the ability to go from zero to 60 mph in 7.5 seconds and boasts a 3,500-pound towing capacity, which is perfect for hauling motorbikes and other equipment. 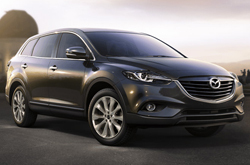 In addition to its performance offerings, the 2015 Mazda CX-9 in Houston provides plenty of room inside the cabin. The second-row seat recline, and slide back and forth in order to increase legroom and create maximum comfort. They also offer substantial space for tall passengers who require a little extra room. On top of these benefits, the new model also allows passengers to easily access the third-row seat and provides 101 cubic feet of cargo capacity, giving owners plenty of space to transport large items. If you want to learn more about the Mazda CX-9 and its great components, continue reading our 2015 Mazda CX-9 review. You can also check out exclusive engine specs and view pics of the new model. 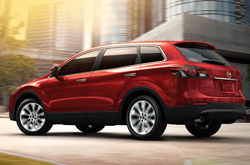 In several areas, the 2015 Chevy Traverse, Dodge Durango and the Ford Edge are outdone by the 2015 Mazda CX-9. With user-friendly in car technologies and an exquisite design, shoppers will love the Mazda CX-9. 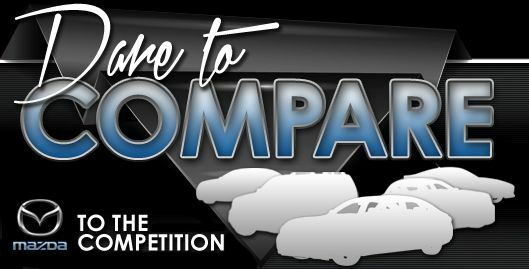 Hundreds of Houston Mazda drivers choose it because it's a fantastic value; just compare its price to the vehicles listed above. Check out our Quick List below for more info about its specs! If you're having a dilemma deciding which Mazda is right for you, please read the Mazda CX-9 review above, along with reviews of other current 2015 models sold at Joe Myers Mazda. With the dedication of some of the most knowledgeable automotive writers in the auto industry, we've managed to get reviews created for all of our models. Filled with valuable information and specs, including cargo capacity and other info, each summary gives you full access to everything Mazda's lineup has to offer. Now that you've learned all about the 2015 Mazda CX-9, we'd love to chat with you; use the form on the right to contact us today to learn about finance offers and schedule time for a test drive!